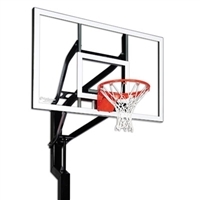 The Goalsetter X448 Extreme Series Basketball System - 48" Glass Backboard takes shooting hoops to a whole new level. 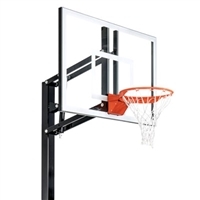 Complete with a 2.5' play area and a competition tempered glass backboard, this system is the ideal combination for all skill levels. It's built with structural steel extension arms, features a 90-degree adjustment handle, and mounts with a patented ground anchor for the ultimate in stability. The Goalsetter All-Star blends a 5" square off-set mast with 3/16" wall thickness and full 4' x 5" square ground anchor for maximum stability. The 36” x 54” tempered glass or acrylic backboard provides a full 3' safety play area and is fast becoming a playground favorite. With the simple turn of the height adjustment handle, the All-Star will infinitely adjust from 6' to 10' for maximum participation and enjoyment. The internal height adjustment mechanism enhances safety by eliminating pinch and grab points. An exciting addition to the Goalsetter line-up, the CONTENDER completely redefines the expectations of a mid-sized goal. 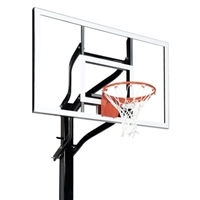 The standard 36" x 54" Competition Tempered GLASS backboard combined with a 4" square structural steel off-set, one-piece pole design make the Contender's ease of adjustability, durability and size unparalleled for home court play. Adjustable from 6' to 10', the internal height adjustment mechanism enhances safety by eliminating pinch and grab points. Get the home court advantage with the Goalsetter Elite Plus basketball hoop. The next time you’re in the mood to ignite your game, hit the open three, or drive the lane … just walk outside. This quality, entry-level basketball hoop adjusts from 7’ to 10’, allowing even the youngest players to perfect their shot! The awning crank height adjustment mechanism is a time-proven, economical system designed to raise and lower the rim. 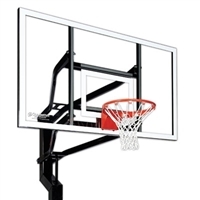 The Elite Plus features a 54” x 36” x 3/8” tempered glass steel-framed backboard (acrylic optional) and offers 2 ½’ of overhang from pole to backboard. The one-piece 4” x 4” straight steel pole is assembled with a 42” square steel anchor placed in the ground and provides unmatched stability and durability. When it’s time to move your Goalsetter basketball hoop moves with you by simply purchasing a replacement ground anchor. Every Goalsetter hoop is made in the United States and backed by a five-year limited warranty. Your Goalsetter basketball goal will provide many years of fun, exercise, and memories for the entire family! Get the home court advantage with a superior basketball system that's built to last! 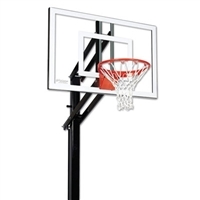 The Goalsetter X454 In-Ground Basketball Hoop offers the innovative features and unbeatable quality of a professional goal at a fraction of the cost. The Goalsetter X454 features a 54" fully-tempered glass or acrylic backboard, heavy duty breakaway rim and 4" square steel pole. The external tension height adjustment mechanism ensures easy, safe and accurate height adjustment from regulation 10' down to 6' 8". 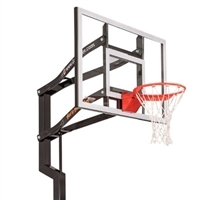 The Goalsetter Extreme Series also offers a 1.5" square steel backboard frame for exceptional durability and stability during play as well as die-formed extension arms that counter backboard torque. And, Goalsetter's patented ground anchor hinge system allows for complete assembly of the goal BEFORE it's raised upright! Each Extreme Series goal is designed to exceed the ordinary demands of the game and rise to the challenge of even your most intense competitive play! All Goalsetter systems are made in the USA. One of the most versatile goals in the Goalsetter line-up, the ALL-AMERICAN blends a 5" square off-set mast with 3/16" wall thickness and full 4' x 5" square ground anchor for maximum stability. The 38" x 60" tempered glass or acrylic backboard provides a full 3' safety play area and is fast becoming a playground favorite. With the simple turn of the height adjustment handle, the All-American will infinitely adjust from 6' to 10' for maximum participation and enjoyment. The internal height adjustment mechanism enhances safety by eliminating pinch and grab points. Matching the MVP in appearance and strength the CAPTAIN gives you a mid-sized backboard option on a 6" square pole and is an ideal choice for a serious player. Combine the ultimate ball response of a standard 38" x 60" Competition Tempered GLASS backboard with the 6" square off-set, one-piece pole and 4' regulation play area and the CAPTAIN brings the indoor basketball experience to your backyard Adjustable from 6' to 10', the internal height adjustment mechanism enhances safety by eliminating pinch and grab points. The Extreme X560 has all the features you want and the quality you expect at an exceptional price. 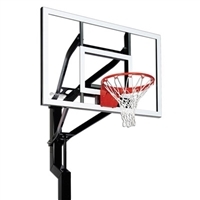 The X560's 38" x 60" x 3/8" competition tempered glass backboard, 5" square structural steel, straight, one-piece pole and 3' play area provides a mid-sized basketball goal loaded with features. Equipped with die-formed extension arms, Goalsetter's patented ground anchor and 90 degree adjustment handle (adjustable from 6'8" – 10') the X560 redefines value. 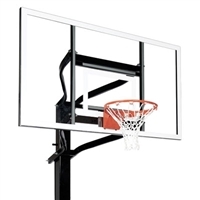 The Goalsetter X660 Extreme Series Basketball System - 60" Glass Backboard is engineered to provide game-stopping features at prices the modern family can afford. 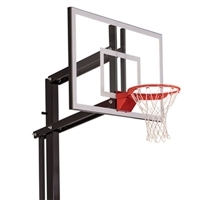 Complete with a competition tempered glass backboard, die-formed extension arms, and a 90-degree adjustment handle, this system is the ultimate in both durability and flexibility. Because the system's height adjusts from nearly 7' to 10', the set accommodates players of all ages as your family grows up. A patented ground anchor provides easy and safe installation and use. And, the 4' regulation play area means your kids won't want to play anywhere else! Get ready. Your driveway is about to become the conversion point for the whole neighborhood. The Goalsetter MVP Basketball System - 72 Inch Backboard is the pinnacle design in the Goalsetter series. It features a distinctive design and regulation backboard and playing area. The backboard is customizable, allowing you to choose either an acrylic board or a tempered glass board. Complete with a corrosion-resistant finish to withstand the wear and tear of outdoor use and an adjustable height mechanism to accommodate players of all sizes and ages. 42 x 72-in. glass or acrylic backboard. 6-in. square off-set steel pole. Corrosion-resistant primer/acrylic enamel finish. Internal adjustment mechanism from 6 to 10 feet. Features a standard rim. 4-foot extension pole increases height. 4-foot regulation play area. 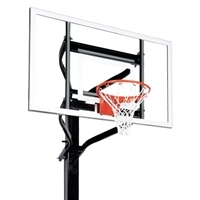 The Goalsetter X672 Extreme Series Basketball System - 72" Glass Backboard has all the features you want at a price you can afford. Complete with a competition tempered glass backboard, a 4' regulation play area, and die-formed extension arms, this set means your kids won't want to play anywhere else! A patented ground anchor means simple installation and safe use, while a 90-degree adjustment handle makes it easy to accommodate players as they grow from middle school to high school and beyond.